These stairs have been online for almost two years, and so far they worked well. But they had a little bug nevertheless In some games (especially the base-game, without any EP) the catalog icon for the modular stairs was empty. This is because these stairs were made in a very old format (the old "EP Ready format, created when UNI first came out). Updating them to the current correct format would have meant breaking all the existing recolours (there are so many around the net, not only here at MTS2); and so I've fixed it in a way that... you shouldn't try at home (like they say in TV ). FAQ: Why there is no text file to install with these stairs, like all the other custom modular stairs? That's because these stairs are intended to override the Maxis originals, and therefore uses the same Maxis text file already installed with the game. The first time I've enabled colour options for one of the most expensive modular stairs (the "Holy Smoke"); now I've done the same for the cheapest one: the "Wooden Stairs". Unpack the attached "Numenor_DeckStairs_main.rar" to the downloads folder (or use the Q-Xpress). There's no need to do anything else. Just like the Holy Smoke, these stairs override the originals (*not* overwrite! ): as long as my package is in the download folder, the original Wooden Stairs are replaced by this recolourable version. Just delete the package from the download folder: the original stairs will be available again in the Build Mode catalog, and all the recoloured stairs you have on your lots will automatically revert to the original colour. Open SimPE's Object Workshop and click the "Open..." button. Browse the downloads folder and load the "Numenor_DeckStairs_main.package". Proceed with the recolour as usual. 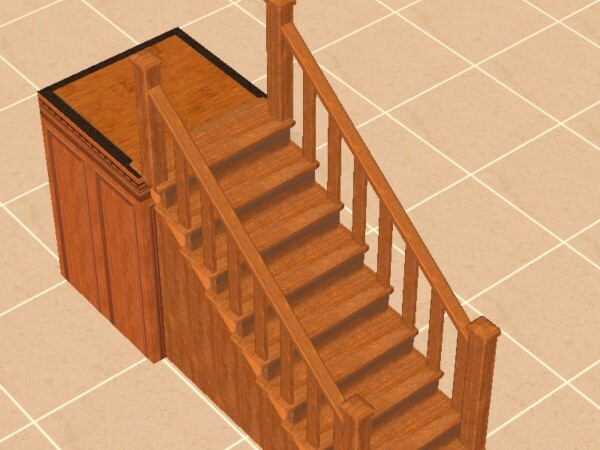 You can find a useful template in the "Recolours for the Wooden Stairs" thread, along with a couple of recolours I've made. Here come the tricky part, because you will not find the different colours in the catalog (I guess that this section of the catalog doesn't manage multiple colour options). 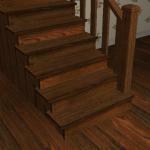 Choose the standard "Wooden Stairs" from the catalog and place it on the lot. 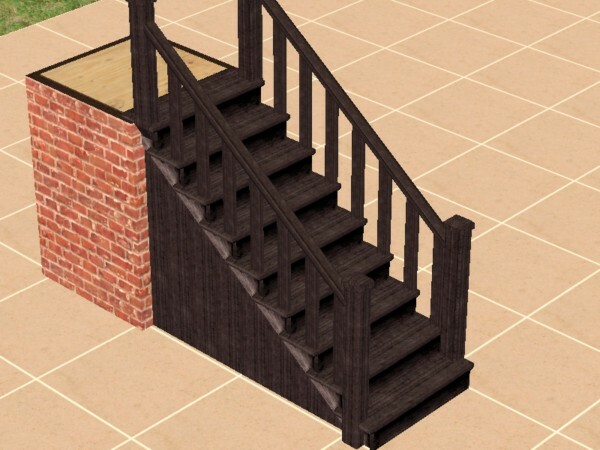 Add the railings if you like, but remember that adding the railings after having recoloured the stairs may cause their reverting to original colour. Now, select the Design Tool and click, in turn, on each step: now you can choose between the available recolours. Detailed instructions with pictures can be found on the "Holy Smoke" thread. I've made a couple of recolours, plus a template: they are posted in the proper "Recolours for the Wooden Stairs" thread, created for these stairs; please post your own recolour there, too. Stairs and Fences in AL Wood Colours.